Inner Out is a 14-day / 2 week program that is designed to generate a progressive cleansing effect on your body in just 14 days. It does this in 3 phases. 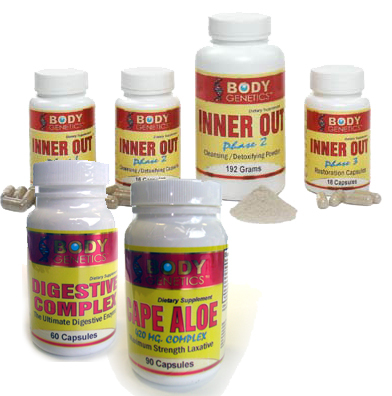 Digestive Complex is another key to promoting better health in the digestive tract is ensuring that your body has a sufficient level of enzymes present to properly digest food--many of us do not! The simple addition of an effective enzyme complex helps correct this problem. Digestive Enzymes...HELPS BREAKDOWN FAT, STARCH, and PROTEIN! This amazing enzyme matrix includes the three principle groups of digestive enzymes: AMYLASE , PROTEASE and LIPASE and also includes: Esterase, Peptidase, Nuclease, Elastase, Collagenase, Trypsin and Chymotrypsin. Take 1 before a meal. Healthy Partners are excluded from Special Discount, sorry!